There are many reasons why a household may experience a power surge, from a nearby lightning strike to accidents involving power lines or utility poles, but the result is generally a temporarily disruption in power service. When the power is restored, some appliances may not immediately return to function. 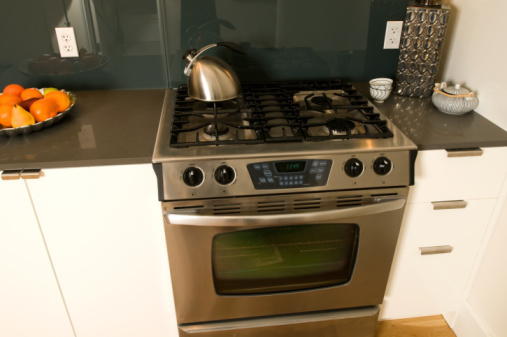 If an appliance such as a GE oven does not work after a power surge, some troubleshooting may be able to restore it to normal use. The first place to start if the GE oven will not power back on after a surge is the home circuit breaker or fuse box. Unplug the oven from the electrical outlet first and then replace any fuses that have blown or reset any tripped circuit breakers. Wait 30 seconds and then plug the oven back in to the electrical outlet. Check the power cord, which may have become loose or was previously loose prior to the power surge. The power plug should be in firm contact with the electrical outlet. It may be necessary to move any other nearby appliances to a different electrical circuit to reset enough power to the oven for proper function. Another potential source of problems after a power surge is the oven igniter. Disconnect power and gas supply and remove the oven bottom panel. Look at the igniter and make sure it is ignited. If it is not, this may have been affected by the surge. While some homeowners are able to replace the igniter, it is typically a task best left to the professionals. The control board in the oven may have been damaged during the power surge and will need to be replaced. Disconnect power to the oven after resetting the circuit breakers or fuses and then restore power after several minutes. If parts of the oven range will work, such as the burners, but not the oven, the control panel may be at fault. Contact GE for service.